This Sunday I had eight guests over for dessert after seeing a movie in the Toronto International Film Festival. I had three hours available to make dessert before heading to the movie; so I knew I had to make something simple. I had a large basket of peaches and decided that I would make use of them. 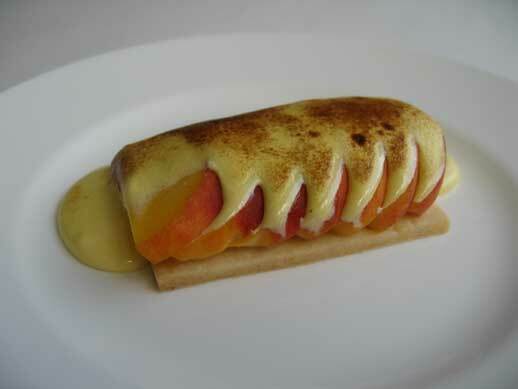 Eighteen peaches later, I had made a trio of desserts. 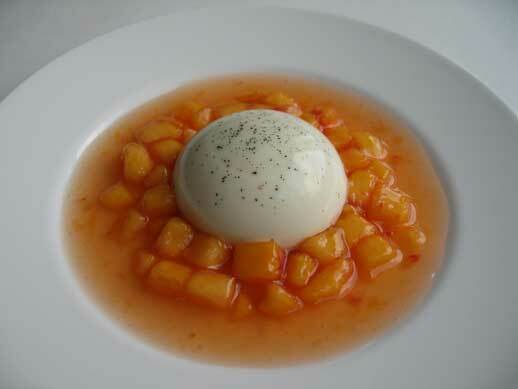 For the vanilla bean panna cotta recipe, check out my post on the panna cotta trials. For a soft and delicate shortbread that you can easily cut through with a fork, try using a recipe with icing sugar, cornstarch and a high butter content. Usually, the softer the dough the softer the cookie will be once it’s baked. 1. Blanche the peeled and sliced ginger root in hot water for a minute. Transfer to a food processor and process for a minute. Then add the peeled and pitted peach halves and process it till pureed. Add the lemon juice and salt to taste. Place this mixture aside or in the fridge. 2. Whip your 35% cream to a stiff peak, but avoid turning your cream into butter. Place the whipped cream in a container and put it in the fridge until needed. 3. In a heatproof bowl, beat the egg yolks lightly with the confectioners’ sugar; then, still beating, place the bowl over a pot of barely simmering water to create a bain-marie. Keep beating the mixture; when the mixture is lukewarm, remove the bowl from the pan and go on beating until the mixture is cool. If you are lazy like me, I just use my KitchenAid bowl over the pot and then transfer the bowl back to the mixer so that it can do all the work. 4. Once the mixture is cool, fold in the peach and ginger puree. Once combined, fold in the whip cream. Pour the parfait mixture into a 6-cup mold, or into a pan that has been lined with parchment paper. Freeze for approximately 4-6 hours. 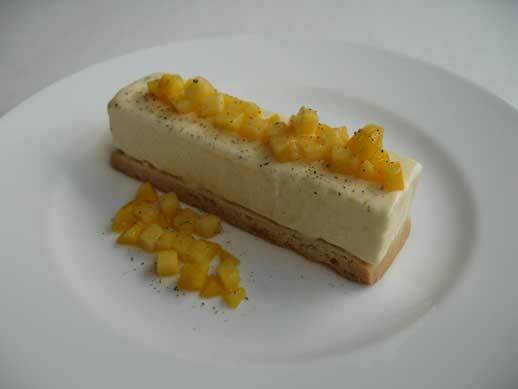 * I would also recommend serving the parfait with small pieces of diced candied ginger. Posted by Sam at 10:51 p.m.
"peaches elegance, peaches elegance, peaches elegance" ... all three! Hi Sam, these desserts all look stunning! I particularly like the idea of the candied ginger on the parfait. 3 desserts in 3 hours... I wish I had your imagination and your speediness!! Congrats!! Those are all amazing...your lucky guests! Three desserts in three hours?! I could make those in three days! Beautiful! I'm beyond impressed! Can I come over for dessert? Peaches are my favorite. Thanks for the elegance, your so sweet. Thanks for visting Gilly. I originally wanted to put candied/crystallized ginger on top, but I didn't have any at home and I didn't have time to go by some. Oh well, maybe next time. You are so nice. One day I am going to come to Buenos Aires and make you dessert! Thanks for continuing to read my blog and for your comments. Thanks! You are a dessert goddess. You have a very sweet blog. Thanks for your comments. If I can do it so can you. You make wonderful desserts. When are you coming over? I will have the vanilla panna cotta on shortbread with peach compote waiting for you. I would have no choice but to eat all of them and not share with anyone. Does that make me a terrible guest? I don't think you could ever be a terrible guest. If you could really eat them all, first I would applaude and then I would get right back into the kitchen and make more. It is as simple as that. Cheers!